Albania is a mountainous country, 28,748 square miles in size, slightly larger than the state of Maryland. It is located in southeastern Europe and borders Montenegro, Serbia, and Macedonia on the north and east, Greece in the south and southeast, and the Adriatic Sea on the west. The name Albania was given by the Romans in ancient times (after a port called Albanopolis); but the Albanians themselves call their country Shiqiptare ("Sons of the Eagle"). The majority of the country's population of 3,360,000 consists of Albanians (more than 95 percent) in addition to assorted minorities: Greeks, Bulgarians, Gypsies, Macedonians, Serbs, Jews, and Vlachs. Followers of organized religions include Muslims (70%), Eastern Orthodox (20%), and Roman Catholics (10%). More than two million Albanians live in neighboring Balkan countries (e.g., Kosovo Region in Yugoslavia, Macedonia, and Turkey) as well as in other countries. The country's capital is Tirana; the Albanian flag is red with a black double-edged eagle, the symbol of freedom. The national language is Albanian. Albanians descend from the ancient Illyrians. Conquered by the Romans in the third century A.D., they were later incorporated into the Byzantine Empire (395 A.D.) and were subjected to foreign invasions by Ghots, Huns, Avars, Serbs, Croats, and Bulgarians. In 1468 Albania became part of the Ottoman Empire despite strong resistance by Gjergj Kastrioti Skenderbeu (George Castrioti Skanderbeg, 1403–1468), who is the most outstanding hero of Albania's fight against foreign subjugation. At the beginning of the nineteenth century, Albania's fight for independence intensified under the leadership of Naim Frasheri (1846–1900), Sami Frasheri (1850–1904), and Andon Zaki Cajupi (1866–1930). During World War I, Albania became a protectorate of the Great Powers after a short period of independence in 1912. It once again gained full independence in 1920, first as a republic and since 1928 as a monarchy under King Ahmet Zogu (1895–1961). In 1939, Albania was invaded and occupied by Italy; it regained independence after World War II, but under a Communist regime (led by Enver Hoxha, 1908–1985), which outlawed religion and suppressed the people. After the collapse of communism in 1991, Albania became a free and democratic country with a multi-party parliamentary system under President Sali Berisha. In 1997, investment pyramid schemes damaged the savings of more than 30 percent of the population. Armed rebellion against the government followed. After United Nations military intervention, order was restored, new elections were held, and a new Socialist alliance government came to power, led by president Rexhep Mejdani. In 1998 and 1999, especially during NATO's involvement in the Kosovo region of Yugoslavia, more than 300,000 Kosovars (ethnic Albanians living in Kosovo) gained asylum in Albania. Few Albanians came to the United States before the twentieth century. The first Albanian, whose name is lost, is reported to have come to the United States in 1876, but soon relocated to Argentina. Kole Kristofor (Nicholas Christopher), from the town of Katundi, was the first recorded Albanian to arrive in the United States, probably between 1884 and 1886. He returned to Albania and came back to the United States in 1892. In The Albanians in America, Constantine Demo records the names of 16 other Albanians who either came with Kole or arrived soon after. They came from Katundi, located in southern Albania. Albanians are the most recent group of Europeans to immigrate to the United States and their numbers have remained small. Prior to World War I, Albanians migrated to America because of poor economic conditions, political concerns, or to escape military conscription in the Turkish army. Many Albanians (between 20,000 and 30,000) who fled Albania for political reasons returned to Albania between 1919 and 1925. Many of these same Albanians re-migrated to the United States, intending to remain permanently in America. Another wave immigrated after Albania came under Communist control in 1944. After the fall of communism, Albanians began entering the United States in increasing numbers between 1990 and 1991. There are no accurate immigration statistics on the most recent immigration. According to U.S. immigration statistics, between the years 1931 and 1975, the total number of Albanians entering the United States was 2,438. After 1982, the official number of Albanians entering the United States is as follows: 1983 (22); 1984(32); 1985 (45); 1986 (n/a); 1987 (62); 1988 (82) 1989 (69); 1990 (n/a); 1991 (141). These immigration figures do not reflect accurately the number of Albanians living in the United States. The 1990 population census reports the number of people claiming at least one ancestor as Albanian at 47,710, although the total population in the United States may range from 75,000 to 150,000 or more. In 1999 the United States granted legal alien status to about 20,000 Kosovar refugees. They joined their families, friends, or charitable sponsors in America, but some only until the conflict in Kosovo subsided. Early Albanian immigrants settled around Boston and then moved to other parts of Massachusetts where unskilled factory labor was plentiful. Prior to 1920, most of the Albanians who migrated to the United States were Orthodox Tosks from the city of Korce in southern Albania. Most were young males who either migrated for economic gain or were seeking political asylum and did not intend to remain permanently in the United States. They lived in community barracks or konaks, where they could live cheaply and send money home. The konak gradually gave way to more permanent family dwellings as more women and children joined Albanian men in the United States. Early Massachusetts settlements were established in Worcester, Natick, Southbridge, Cambridge, and Lowell. The 1990 census reveals that the largest number of Albanians live in New York City with a high concentration in the Bronx, followed by Massachusetts, Michigan, New Jersey, Illinois, California, Ohio, and Pennsylvania. Settlements of Albanians can be found in Chicago, Los Angeles, Denver, Detroit, New Orleans, Miami, Pittsburgh, and Washington, D.C.
Current studies that fully record the experiences and the contributions of Albanian Americans in the United States do not exist. Albanian neighborhoods have tended to resist assimilation in the United States. The communities in New York and Massachusetts have tended to be restricted and interaction with other groups has been infrequent. Other groups of Albanians in the Midwest may have assimilated more quickly. In 1935, a newspaper reported that the Albanians were "not a clannish people . . . [they] associate freely with other nationalities, do business with them, partake of their common culture, and participate in a typically middle class way to the general life of the city" (Arch Farmer, "All the World Sends Sons to Become Americans," Chicago Sunday Tribune, July 28, 1935). Albanians have often been confused with other ethnic groups, such as Greeks or Armenians. They have succeeded in preserving a sense of communal identity, customs, and traditions in the numerous clubs, associations and coffee-houses ( vatra ) that have been organized wherever Albanians live. Most of the early Albanians who immigrated to the United States were illiterate. According to Denna Page in The Albanian-American Odyssey , it was estimated that of the 5,000 Albanians in America in 1906, only 20 of them could read or write their own language. Due to the strong efforts of community leaders to make books, pamphlets, and other educational materials (especially the newspaper, Kombi ) available in the konaks, the rate of illiteracy declined significantly. By 1919, 15,000 of 40,000 Albanians could read and write their own language. Albanians remained suspicious of American ways of life and were often reluctant to send their children to American schools. Gradually, they accepted the fact that an education provided the foundation for a better way of life in America. Albanian dishes have been heavily influenced by Turkey, Greece, Armenia, and Syria. Recipes have often been adapted and altered to suit American tastes. Albanians enjoy a variety of appetizers, soups, casseroles, pilaf, pies, stews, and desserts. Salads ( sallate ) are made with cabbage, lettuce, onions, peppers, olives, and feta cheese. Sallate me patate is a potato salad. Soups are made with a variety of ingredients such as beans, chicken, lentils, and fish. Pace, a soup made with lamb's tripe, is served at Easter. Albanian pies, lakror-byrek, are prepared with a variety of gjelle ("filling"). Fillings may be lamb, beef, cabbage, leeks, onions, squash, or spinach, combined with milk, eggs, and olive oil. A lakror known as brushtul lakror is made with a cottage and feta cheese filling, butter and eggs. Domate me qepe is a lakror made with an onion and tomato filling. Stews are made with beef, rabbit, lamb, veal, and chicken, which are combined with cabbage, spinach, green beans, okra, or lentils. Favorites include mish me patate (lamb with potatoes), comblek (beef with onions) and comblek me lepur (rabbit stew). A popular dish with Albanian Italians living in Sicily is Olives and Beef Albanesi-Siciliano, which consists of brown, salted beef cubes in a sauce of tomatoes, parsley, garlic, olives, and olive oil and served with taccozzelli (rectangles of pasta and goat cheese). Dollma is a term applied to a variety of stuffed dishes, which consist of cabbage, green peppers, or vine leaves, and may be filled with rice, bread, onions, and garlic. An Albanian American variation of the traditionally Greek lasagna-like dish, moussaka, is made with potatoes and hamburger instead of eggplant. Albanians enjoy a variety of candies, cookies, custards, sweet breads, and preserves. They include halva , a confection made with sugar, flour, butter, maple syrup, water, oil, and nuts; te matur, a pastry filled with butter and syrup; baklava, a filo pastry made with nuts, sugar, and cinnamon; kadaif, a pastry made with shredded dough, butter, and walnuts; and lokume, a Turkish paste. Popular cookies include kurabie, a butter cookie made without liquid; finique , a filled cookie with many variations; and kuluraqka-kulure, Albanian "tea cookies." Te dredhura, bukevale, and brustull are hot sweet breads. Family members will announce the birth of a child by making and distributing petulla, pieces of fried dough sprinkled with sugar or dipped in syrup. Albanians enjoy Turkish coffee or Albanian coffee ( kafe ), Albanian whiskey ( raki ) and wine. Kos, a fermented milk drink, is still popular. Albanian costumes have been influenced by Turkey, Greece, and Persian-Tartar designs. Albanian traditional costumes vary depending on the region. In countries where Albanians have established themselves, traditional costumes often distinguish the region in Albania from which the Albanian originally came. A man's costume from Malesia (Malcija Vogel area), for example, consists of close-fitting woolen trousers with black cord trim, an apron of wool with a leather belt buckled over it, and a silk jacket with long dull red sleeves with white stripes. A long sleeveless coat may be worn over the jacket along with an outer, short-sleeved jacket ( dzurdin ). The head and neck may be covered with a white cloth. A style of male dress most often seen in the United States is the fustanella, a full, white pleated skirt; a black and gold jacket; a red flat fez with a large tassel ( puskel ); and shoes with black pompoms. Women's clothing tends to be more colorful than the men's clothing. Northern Albanian costumes tend to be more ornamental and include a distinctive metal belt. Basic types of costume include a wide skirt ( xhublete ), long shirt or blouse ( krahol ), and a short woolen jacket ( xhoke ). The traditional costume of Moslem women may include a tightly pleated skirt ( kanac ) or large woollen trousers ( brekeshe ). Aprons are a pervasive feature in every type of women's costume and great variety is seen in their shape and embroidery. Many Albanian Americans often wear traditional costumes during Independence Day celebrations and other special occasions and social events. Since Albanian Americans are members of either Roman Catholic, Orthodox, or Islamic faiths, many religious festivals and holy days are observed. November 28 is celebrated as Albanian Independence Day, the day that Albanians declared their independence from the Ottoman Empire in 1912. Many Albanian Albanians also recognize the Kosova declaration of independence from Serbia on July 2, 1990. Although the Albanian musical tradition has been influenced by neighboring countries such as Greece, much of the musical folklore remains distinct. Albania has had a rich tradition of musical and theatrical activities. In 1915, Albanian Americans organized the Boston Mandolin Club and the Albanian String Orchestra. They also had amateur groups perform plays by Albanian authors. Because the heroic sense of life has always been part of Albanian life, ballads are often recited and sung in an epic-recitative form that celebrates not only fantastic heroes of the past but also more recent heroes and their deeds in modern history. Songs may be accompanied by traditional instruments such as the two stringed cifteli , a lute instrument, and a lahuta , a one-stringed violin. Albanian is probably part of the Illyrian branch of eastern Indo-European languages. It is a descendant of Dacian, one of the ancient languages that were among the Thraco-Phrygian group once spoken in Anatolia and the Balkan Peninsula. Its closest modern relative is Armenian. Today, Albanian is spoken in two major dialects (with many subdialects) in Albania and in neighboring Kosova— Tosk (about two-thirds of the population) and Gheg (the remaining one-third). A third dialect ( Arberesh ) is spoken in Greece and southern Italy. Throughout the centuries, Albania has endured numerous invasions and occupations of foreign armies, all of whom have left their influence on the language. Despite outside influence, a distinct Albanian language has survived. Albanians call their language " shqip. " Until the early twentieth century, Albanians used the Greek, Latin, and Turko-Arabic alphabets and mixtures of these alphabets. In 1908, Albania adopted a standard Latin alphabet of 26 letters, which was made official in 1924. During the 1920s and 1930s, the government tried to establish a mixed Tosk and Gheg dialect from the Elbascan region as the official language. In 1952, a standardized Albanian language was adopted, which is a mixture of Gheg and Tosk but with a prevailing Tosk element. In addition to the letters of the Latin alphabet, the Albanian language adds: "dh," "gf," "ll," "nj," "rr," "sh," "th," "xh," and "zh." Albanian is taught at such universities as the University of California-San Diego, University of Chicago, University of North Carolina-Chapel Hill, and Cleveland State University. Libraries with Albanian language collections include the Library of Congress, Chicago Public Library, Boston Public Library, New York Public Library (Donnel Library Center), and Queens Borough Public Library. Some common expressions in the Albanian language include: Po ("Yes"); Jo ("No"); Te falemnderit/Ju falemnderit ("Thank you"); Po, ju lutem ("Yes, please"); Miredita ("Hello" or "Good day"); Miremengjes ("Good Morning"); Si jeni? ("How are you? "); Gezohem t'ju njoh ("Pleased to meet you" or "morning"); Mirembrema ("Good evening"); Naten e mire ("Good night"); Mirupafshim ("Goodbye"); Me fal/Me falni ("Excuse me"); Ne rregull ("All right" or "Okay"); S'ka perse ("Don't mention it"); Gjuha vete ku dhemb dhemballa ("The tongue follows the toothache"); Shqiptare ("Albanians"). The Kanun ( Kanuni I Leke Dukagjinit ) is an ancient set of civil, criminal, and family laws that still exerts influence on the lives of many Albanian Americans. The Kanun is traditionally ascribed to Leke Dukagjini (1460–1481), a compatriot and contemporary of Skanderberg. It sets forth rights and obligations regarding the church, family, and marriage. The code is based on the concepts of honor ( bessa ) and blood; the individual is obligated to guard the honor of family, clan, and tribe. The rights and obligations surrounding the concept of honor have often led to the blood feud ( gjak ), which frequently lasts for generations. At the time of King Zog in the 1920s, the blood feud accounted for one out four male deaths in Albania. This code was translated into English and published in a bilingual text in 1989 in the United States. American attorneys brought the code to the attention of Albanian lawyers to help Albania codify their new legislation after the collapse of communism. According to a newspaper article, the code is "the central part of their legal and cultural identity" ( New York Times, November 11, 1994, p. B-20). The Kanun defines the family as a "group of human beings who live under the same roof, whose aim is to increase their number by means of marriage for their establishment and the evolution of their state and for the development of their reason and intellect." The traditional Albanian household is a patriarchy in which the head of the household is the eldest male. The principal roles of the wife are to keep house and raise the children. The children have a duty to honor their parents and respect their wishes. 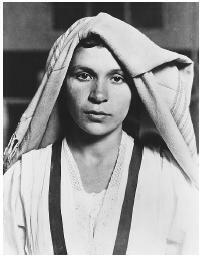 This photograph was taken shortly after this young Albanian woman entered the United States. and a career. After graduation and before marriage, women have often helped with the family business. Albanian women have usually married at an early age. During the 1920s and 1930s, Albanian men outnumbered Albanian women in the United States by about three to one. Many Albanian men considered their stay in America temporary and therefore left their wives in Albania with the intent of making enough money to return home. During this period, when Albanian women were in short supply, Albanian men in the United States began to "order" wives from Albania. The man usually supplied the dowry, which compensated the girl's parents for her fare to the United States. Today many Albanian American women feel caught between two worlds. They often feel obligated to conform to the standards and mores of their community but, at the same time, are pressured to "Americanize." Although many Albanian American women have pursued higher education and careers outside the home, many in the community still view these pursuits as inappropriate. Albanian American women have only recently begun to organize. The Motrat Qirijazi (Sisters Qirjazi), the first Albanian-American women's organization, was founded on March 27, 1993. The principal founder and current president is Shqipe Baba. This organization serves all Albanian women in the United States, assisting and supporting them in the pursuit of unity, education, and advancement. Traditionally, Albanian weddings are arranged by parents or by an intermediary or matchmaker. The festivities may begin a week before the wedding ( jav' e nuses —"marriage week"). Usually, an engagement ceremony is held between the two families and the bride is given a gold coin as a token of the engagement. A celebration is held at the home of the bride's parents and the future bride is given gifts and sweets. Refreshments are usually served. A second celebration is given by the family of the groom and the bride's family attends. At these celebrations, small favors of candy-coated almonds ( kufeta ) are exchanged. In Albania, a dowry is usually given but this custom is not followed in the United States. A week before the ceremony, wedding preparations began. During this week, relatives and friends visit the homes of the couple and food preparation begins. A chickpea bread ( buke me qiqra ) is usually prepared. Gifts to the groom and the bride's trousseau and wedding clothes are displayed. A party is given in which family and friends attend. Members of the groom's family come to the house of the bride and invite her to the festivities. They carry wine, flowers, and a plate of rice, almond candy, and coins with a cake on top. The groom also invites the kumbare (godfather) and vellam (best man). The bride gives similar gifts. The party is a time of great rejoicing with food, drink, dancing, and singing. Around midnight, the bride and groom, with family and friends, go in opposite directions to three different bodies of water to fill two containers. Coins are thrown into the air at each stop for anyone to pick up. On the day of the wedding, the bride is dressed, given a sip of wine by her parents along with their good wishes. Other family members give her money. The vellam brings in the bride's shoes, filled with rice and almond candy, wrapped in a silk handkerchief. Accompanied by singing women, the vellam puts the shoes on the bride and gives money to the person who assisted the bride in dressing. The vellam is encouraged to give everybody money. He throws coins into the air three times and everyone tries to get one coin. The groom's family accompanies the bride to the ceremony. The ceremony is followed by a reception. On the following day, the bride may be visited by her family, who bring sweets ( me peme ). One week after the ceremony, the couple is visited by friends and relatives. This is called "first visit" ( te pare ). After a few weeks, the bride's dowry may be displayed (in Albania) and the bride, in turn, distributes gifts to the groom's family. The couple is sent off with good wishes: " te trashegojen e te plaken; jete te gjate me dashuri " or "a long, happy, healthy life together" ("Albanian Customs," Albanian Cookbook [Worcester, Massachusetts: Women's Guild, St. Mary's Albanian Orthodox Church] 1977). Traditionally, the one who tells friends and relatives that a child has been born receives a siharik ( tip). Within three days after the birth, the family makes petulla (fried dough or fritters) and distributes them to friends and family. A hot sweet bread ( buevale ) may also be prepared for guests who visit the mother and child. A celebration is usually held on the third day where friends and relatives bring petulla and other gifts. In the Orthodox Church, this celebration may be delayed until the child is baptized. Traditionally, for Albanians of the Orthodox faith, the kumbare and ndrikull (godparents) choose the name of the child to be baptized. Many superstitions surround the birth of an Albanian child. Among older Albanian Americans may of these superstitions may still exist. Infants are especially vulnerable to the "evil eye" and many Albanian mothers will place a kuleta (amulet) on a new-born child. For Christians, the kuleta may be a small cross, and among Muslims, it may be a small triangular silver form ( hajmali ). Garlic may also ward off evil. A person who touches an Albanian child or offers a compliment is required to say " Mashalla " (as God wishes) to ward off the misfortune of the evil eye. Among Orthodox Christians, birthdays are not traditionally observed. Instead, the family observes a "name's day" for the saint after whom the person is named. Family and friends may gather together and wish the person a "happy nameday" and "good health and long life." The family may serve guests fruit preserves ( liko ), pastries ( te embla ), Albanian whiskey ( raki ), and coffee ( kafe ). Guests would be formally served in the reception room ( ode ) or the living room ( vater ). The guests are treated with great courtesy and all formalities are observed. 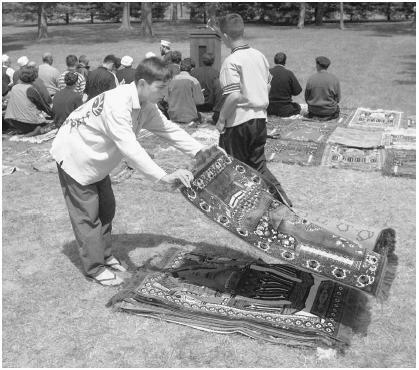 This ethnic Albanian refugee carefully shakes the dust off a prayer rug as he collects them while others continue to pray near the end of a Muslim prayer service at a refugee village at Fort Dix, New Jersey. is located in South Boston. One of the oldest chapters of the St. George Cathedral was organized in Worcester, Massachusetts, in 1911. This chapter became the Church of Saint Mary's Assumption in 1915. The Albanian Orthodox Archdiocese of America, established in 1950 by Bishop Mark Lipa, is under the jurisdiction of the ecumenical Patriarch of Constantinople. This Archdiocese currently administers two churches, Saint Nicholas in Chicago and Holy Trinity in South Boston. Albanian Roman Catholics began coming to the United States in the 1960s and 1970s. At present, three Albanian Catholic churches exist in the United States: Church of Our Lady of Shkodra, located in the Bronx, New York City, founded in 1969 and has a membership of 1,350; St. Paul Catholic Church, located in Warren, Michigan; and Our Lady of the Albanians, located in Beverly Hills, Michigan. Albanian Muslims came to the United States around 1913. Currently, there are between 25,000 and 30,000 Albanian Muslims in the United States, primarily of the Sunni division within Islam. The Presidency of Albanian Muslim Community Centers in the United States and Canada was founded in 1992 by Imam Vehbi Ismail (1919– ) in an attempt to provide unity for Muslims of Albanian heritage. The Presidency comprises 13 community centers or mosques located in Connecticut, Philadelphia, Toronto, New York, New Jersey, Florida, and Michigan. Albanian Americans of all faiths are welcome at these centers (for more information on Albanian Muslims, contact Imam Vehbi Ismail, Albanian Islamic Center, 20426 Country Club Road, Harper Woods, Michigan 48236). A small sect of Muslims of the Bektaski Order, the First Albanian Teke Bektashiane in America, is located in Taylor, Michigan. The Order was founded in 1954. They have a small library and publish The Voice of Bektashism. The Albanians who came to the United States prior to 1920 were from rural backgrounds and worked as farmers, while others from the urban areas worked as small shopkeepers and tradesmen. The large population of Albanians who settled in Massachusetts found work with the American Optical Company of Southbridge and the textile mills of New Bedford. Others worked as cooks, waiters, and bellhops. Albanians soon began opening their own businesses. The most successful Albanian businesses were fruit stores and restaurants. "By 1925...most Albanians of Greater Boston could claim ownership of over three hundred grocery and fruit stores" (Dennis Lazar, Ethnic Community as it Applies to a Less Visible National Group: The Albanian Community of Boston, Massachusetts [Rensselaer Polytechnic Institute, doctoral dissertation, 1982], p. 6). Today Albanians are employed in a variety of professional and enterprises. The Ghegs and Kosovars have been especially successful in the Bronx area of New York City, selling and managing real estate. Albanian Americans have always felt a strong attachment to Albania and have supported events that occur in the homeland. Both the Orthodox church and the Albanian press have played important roles in the awakening of Albanian nationalism in the United States. The early political efforts of Albanian Americans centered upon furthering the cause of Albania's independence from the Ottoman Empire by instilling a sense of pride in Albanian heritage. Early names in the nationalist movement were Petro Nini Luarasi, who founded the first Albanian national organization in America, the Mali i Memedheut ("Longing for the Homeland"), and Sotir Petsi, who founded Kombi, the first known Albanian weekly newspaper. Kombi actively supported an independent Albania, run by Albanians, within the Turkish empire. The circulation of this early newspaper was instrumental in reducing the rate of illiteracy among Albanians in the United States. Fan S. Noli was one of the most influential figures in the Albanian Nationalist movement in the United States. On January 6, 1907, he founded Besa-Besen ("Loyalty"), the first Albanian Nationalist organization in the United States. The founding of the Albanian Orthodox Church in America in 1908 was also a significant event in the life of Albanian Americans. To further Albania's freedom, Fan Noli began publication of Dielli ("The Sun") in 1909. A successor to Kombi, Dielli supported liberation for Albania. Faik Konitza became the first editor of Dielli. To further strengthen the cause, a merger of many existing Albanian organizations occurred in April 1912, becoming the Pan-Albanian Federation of America ( Vatra ). Vatra became the principal organization to instill Albanians with a sense of national purpose. Since the end of World War II, Albanian Americans have shown an increasing interest in American politics, as the process relates to Albanian issues. The Albanian Congressional Caucus has recently been formed with the support of congressional members Eliot Engle (NY-D), Susan Molinare (NY), and others. Its purpose is to promote Albanian causes with a focus on the plight of Albanians in Kosova. With the defeat of communism in Albania, many new immigrants have arrived in the United States. Several new immigrant aid societies, such as the New England Albanian Relief Organization, Frosinia Organization, and the Albanian Humanitarian Aid Inc., have been organized to assist newly arrived Albanian immigrants. Such organizations have also worked to assist Albanians in Albania. Arshi Pipa (1920– ), born in Scutari, Albania, taught humanities, philosophy, and Italian at various colleges and universities in Albania and in the United States. 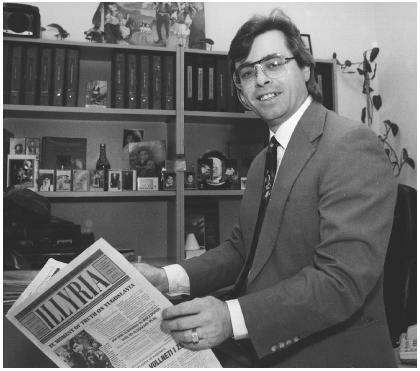 Nicholas Pano (1934– ) is a professor of history and has served as the Dean of Arts and Sciences at Western Illinois University; he has made contributions to scholarly journals on the subject of Albania and is the author of The People's Republic of Albania (1968). Peter R. Prifti (1924– ), author and translator, has made significant contributions to Albanian studies and has published widely on a variety of Albanian topics; he is the author of Socialist Albania Since 1944 (1978). Stavro Skendi (1906–1989), born in Korce, Albania, was Emeritus Professor of Balkan Languages and Culture at Columbia University from 1972 until his death. Anthony Athanas (1912– ) is a community leader and has been a restaurateur in Boston for over 50 years. Constantine A. Chekrezi, an early supporter of the nationalist movement in Albania, briefly served as editor of Dielli in 1914 and published Illyria from March to November 1916; he is the author of Albania Past and Present (1919), which is considered to be the first work in English on Albania written by an Albanian, A History of Europe—Ancient, Medieval and Modern (1921), an early history of Europe written in Albanian, and an English-Albanian Dictionary (1923). Christo Dako, an educator and a key figure in the early nationalist movement, is the author of Albania, the Master Key to the Near East (1919). Faik Konitza (1876–1942), was one of the more influential leaders of the Albanian community in America in the early twentieth century; he published the magazine Albania from 1897–1909 and was the editor of Dielli from 1909–1910, and 1921–1926; he also co-founded the Pan-American Federation of America in 1912, serving as its president from 1921–1926; he served as Minister Plenipotentiary of Albania from 1926–1939. Fan Stylian Noli (1865–1964) was one of the most well-known and distinguished historical personalities in the Albanian community; a major figure in the Albanian nationalist movement, Noli founded the Albanian Orthodox Church In America in 1908. Eftalia Tsina (1870–1953), the mother of physician Dimitra Elia, was an early promoter of Albanian social and cultural issues; in the 1920s, she founded Bashkimi, the first Albanian women's organization in Boston. John Belushi (1949–1982), actor and comedian, is best known for his work on the original television series Saturday Night Live (1975–1979); his movies include: Goin' South (1978), National Lampoon's Animal House (1978), Old Boyfriends (1979), The Blues Brothers (1980), Continental Divide (1981), and Neighbors (1981). His brother, James (Jim) Belushi (1954– ) is an actor and comedian who has been in films since 1978; his best-known films include: The Principal (1987), Red Heat (1988), K-9 (1989), Mr. Destiny (1990), Only the Lonely (1991), Curly Sue (1991), and Diary of a Hitman (1992). Stan Dragoti (1932– ) is a prominent director and producer who is best known for his work in movies and television; his best-known work as a movie director includes: Dirty Little Billy (1973), Love at First Bite (1979), Mr. Mom (1983), The Man with One Red Shoe (1985), She's Out of Control (1989), and Necessary Roughness (1991). Gjon Mili (1904–1984), a photographer for Life magazine and other magazines from 1939, is best known for his innovative and visionary work with color and high speed photography. His vivid images are well known to readers of Life; collections of his work are housed in the Museum of Modern Art (New York), Time-Life Library (New York), Massachusetts Institute of Technology (Cambridge), and the Bibliotheque Nationale (Paris). Donald Lambro (1940– ) is a writer, political analyst, and investigative reporter whose writings include The Federal Rathole (1975), Conscience of a Young Conservative (1976), Fat City: How Washington Wastes Your Taxes (1980), Washington—City of Scandals: Investigating Congress and Other Big Spenders (1984) and Land of Opportunity: The Entrepreneurial Spirit in America (1986). Andrew and Dimitra Tsina Elia were early pioneers in the Albanian community in the field of medicine. Andrew Elia (1906–1991) graduated from Boston University Medical School in 1935 and was a practicing obstetrician and gynecologist in the Boston area. Dimitra Elia (1906–1965) was one of the first Albanian American women to practice general medicine in the United States. Thomas Nassi (1892– ), musician and composer, graduated from the New England Conservatory of Music in 1918; he trained choirs for the Cathedral of St. George in Boston and for churches in Natick, Worcester, and Southbridge, Massachusetts, between 1916–1918. He also arranged Byzantine liturgical responses in Albanian for mixed choirs. Steven Peters (1907–1990) served as a research analyst in the U.S. State Department in 1945 and the Foreign Service in 1958; he is the author of The Anatomy of Communist Takeovers and the government publications, Area Handbook for the Soviet Union and Area Handbook for Albania. Rifat Tirana (c. 1907–1952), an economist, was a member of the staff of the League of Nations in the 1930s; at the time of his death, he was serving as deputy chief of the U.S. Security Agency Mission to Spain; he authored The Spoil of Europe (1941). Bardhyl Rifat Tirana (1937– ) served as co-chair of the Presidential Inaugural Committee (1976–1977) and director of the Defense Civil Preparedness Agency (1977–1979). Lee Constantine Elia (1937– ), baseball player, coach, and manager, managed the Chicago Cubs (1982–1983) and the Philadelphia Phillies (1987–1988). Shqipe Malushi, poet, essayist, media information specialist and an active community leader, has published fiction, nonfiction, translations, essays, and newspapers articles; her works of poetry, written in Albanian and in English, include: Memories of '72 (1972, in Kosova), Exile (1981), Solitude (1985), Crossing the Bridges (1990), and For You (1993); she has published Beyond the Walls of the Forgotten Land (1992), a collection of short stories, and Transformation (1988), a book of essays. She has also written and collaborated on several plays and screenplays. Loretta Chase (1949– ), born in Worcester, Massachusetts, is a popular writer of romance novels for Regency and Avon Presses; her novels include: Isabella (1987), Viscount Vagabond (1988), and Knaves Wager (1990). Nexmie Zaimi is the author of Daughter of the Eagle: The Autobiography of an Albanian Girl (1937), which describes her immigrant experience, customs, and practices. Reports on happenings in the Albanian community in the United States and headlines from Albania. Address: AlbAmerica Trade & Consulting International, 8578 Gwynedd Way, Springfield, VA 22153. Albanian and English weekly, one of the oldest Albanian newspapers, published by the Pan Albanian Federation of America, Vatra . It publishes articles on social, cultural, and political events of interest to Albanians. Address: 167 East 82nd Street, New York, New York 10028. Drita e Vertete (True Light). Monthly bilingual of the Albanian Orthodox Diocese in America. Contact: Rev. Bishop Mar Lippa. Address: 523 East Broadway, South Boston, Massachusetts 02127-4415. Albanian and English bi-weekly published by the Illyrian Publishing Company featuring international news with a focus on news from the Balkans. Emphasis is currently on political events of interest to Albanian Americans; however, the paper is beginning to focus on local community events as well. Address: 2321 Hughes Avenue, Bronx, New York 10458-8120. Albanian and English monthly published by the Free Albania Organization. Features local and national news on Albanian community life and events and news from Albania. Address: PO Box 15507, Boston, Massachusetts 02215-0009. "Albanian Hour" is the oldest continuous Albanian radio program in the country; it airs on Saturday from 8:30 to 9:30 p.m. It broadcasts local community news and events and international news from Albania. Lately, it focuses on concerns of new immigrants from Albania. Address: 910 Main Street, Worcester, Massachusetts 01602. "LDK Radio Program" ("Democratic League of Kosova") airs on Friday, 7:00 to 8:00 p.m. It presents local news, community events, and international news. Address: 449 Broadway, Second Floor, New York, New York 10013. Telephone: (212) 966-1059; or (718) 933-6202. "Voice of Malesia" airs on Monday from 7:00 to 8:00 p.m. It features community events, music, interviews, and news from Albania. Telephone: (212) 966-1059; or (718) 898-0107. "Albanian Hour of Boston," formerly, "Voice of Albania," airs every Sunday evening from 8:00 to 9:00 p.m. It features local community news and events, music, and interviews as well as news from Albania. Address: P.O. Box 170, Cambridge, Massachusetts 02238. "Festival of the Albanian Music" airs on Sundays, 8:30 to 9:00 p.m. and features music from Albania. Address: 449 Broadway, New York, New York 10013. Telephone: (212) 966-1059; or (718) 733-6900. At present, Albania is undergoing rapid changes and Albanian Americans are responding. Since the fall of the Communist government in Albania (1990–1992), several new relief organizations such as the Frosinia Organization (New York City), New England Albanian Relief Organization (Worcester, Massachusetts), and Albanian Humanitarian Aid Inc. (New York City) have been formed within the Albanian community to assist newly arrived immigrants. Second, many long standing Albanian organizations and associations in the United States are redefining their function in view of the new political order that now exists in Albania. Founded in 1986, the organization is dedicated to informing the American public about the political and social problems in Albania. Address: 743 Astor Ave., Bronx, New York 10457. Albanian American National Organization (AANO). Founded in 1938 as the Albanian Youth Organization, it is a non-denominational cultural organization open to all Albanians and Americans of Albanian descent. Address: 22 Dayton Street, Worcester, Massachusetts 10609. Charitable organization aimint to assist Kosovo Albanian refugees in the United States and abroad. Address: 2322 Arthur Ave., Ste. 4, Bronx, New York 10458. Gathers and disseminates information on the state of religion in Albania; conducts research on Albania's religious and cultural history; maintains collection of materials pertaining to Albanian history. Contact: Raymond Frost, Exec. Dir. Address: University of San Francisco, Xavier Hall, San Francisco, California 94117-1080. Founded in 1988, the organization provides assistance to all people of Albanian descent regardless of religion. Address: 11661 Hamtramck, Michigan 48212. Pan-Albanian Organization, " Vatra ." Founded in 1912, Vatra is a national organization open to all Albanians 18 years of age and older. The organization is well known to all Albanians and has played an active political and cultural role in the community. It has sponsored many charitable, cultural, and social events and publishes books on Albanian culture. The organization has provided scholarships for students of Albanian descent. Vatra has recently relocated from South Boston to New York. It continues to publish the newspaper Dielli. Address: 167 East 82nd Street, New York, New York. The library and archives contain the papers of Fan S. Noli. Address: Albanian Orthodox Archdiocese in America, St. George Albanian Orthodox Cathedral, 529 East Broadway, South Boston, Massachusetts 02127. Demo, Constantine. The Albanians in America: The First Arrivals. Boston: Society of Fatbardhesia of Katundi, 1960. Noli, Fan S. Fiftieth Anniversary Book of the Albanian Orthodox Church in America, 1908–1958. Boston: Pan-Albanian Federation of America, 1960. Page, Denna L. The Albanian-American Odyssey: A Pilot Study of the Albanian Community of Boston, Massachusetts. New York: AMS Press, 1987. Roucek, Joseph. "Albanian Americans." In One America, edited by Francis Brown and Joseph S. Roucek. New York: Prentice Hall, 1952; pp. 232-239.
thank you who did it this, because I realy like it all of the parts.. But I wanted to say that in Macedonia are about 50% Albanians..
and also in Montenegro( mal te zi, Malsia e madhe)and also in Serbia in some places because some cities were Albanin and Sllavs took it just like in Macedonia and Montenegro they divided Albanian parts and also Cameria Chameria in Greece.. Thank to all Alabanians that help writing this information. I know that we are "proud to be Albanian" but here I see more demonstrated! Congratulations! Very enjoyable. I have studied the Albanian dialects for over 30 years, have enjoyed the folk music, the cooking. Among all the languages that I have studied and learned over the years, Gjuha Shqipe is my first love. Glad to see that Dielli is still being published; does anyone know if Bashkimi is being published? I used to read the old BK and Ligaliteti publications. A lot has changed since E.H. passed on. One day I hope to visit and see the monument in Kruja and the pretty girls of Dardha, and chit-chat with old MiG pilots from Berat and Tirana airbases. A great informative website. Proud Albanian American. Thankyou! This is the most complete collection of information about Albania and Albanian culture and people that I have ever read! I am American, living in the UK. Recently my family spent 20 months in Albania (Tirana, Durres Plaghe and Mullet) What a beautiful country, and what beautiful people we met there! We made many good friends there. I can't wait to go back! I am looking for anyone who could give me some information. I am looking for assistance for school for an Albanian girl from Elbasan who has arrived here on 8/16/07. She has been accepted to a Catholic high school in New Jersey. Her sponsor is from Brooklyn NY and she will be living in NJ to go to school. During this year long process of getting her here, her father has become unemployed. I have tried in vain to find any scholarships for her because it is now too late in the year to apply. She is a straight A student all her life and her dream to go to school here has finally materialized except now for this unexpected development of her father's loss of work. If there is anyone who could point me in some direction for finding help for her I would greatly appreciate it. I really enjoyed reading this article. It is useful for Albanians with all the information provided about Albanian news, radio and organizations. It is also useful for others who want to grasp an idea about the Albanian culture and background. It is precise and it touches the most important events of our history and some of the wonderful traditions of Albanians. thank you to you all who did this its grate and i love it. its very intrestin for some people from difrent nationality to raded and see what albanians are. or for albanians who been leaving in USA for soo long and they dont know they history they can find it in hear its wonder full. i will like to thank very mach this peaple whu got this informative hear,im albanian and i live in uk,last manth i went to america to meet mi ex gerlfrend,and i think there wos great albanian commynity cast like in uk,( im glad and praud to be albanian )i wish oll albanians oll the best. I DO CONGRATULATE YOU FOR THE TOPIC YOU HAVE CHOOSEN TO ELABORATE! I´M ALBANIAN AND I AM PROUD WITH OUR CULTURE AND OUR ANCIENT ROOTS! This is a great site. I am doing a project for school on Albania and this site provided a lot of information. Thank you a lot for all the information provided above referring our country and our people...I did not know that there were researches conducted in University of San Francisco relevant to our history.For the moment I am at UC Berkeley and I did not find in Berkeley any research or study donne referring albanians.again,thank you!!! I would like to thank the writer(s) of this article for giving Albanians such useful and interesting information. As a lot of people may know Albania has been living in the dark for many years due to communism and a lot of Albanians that have migrated across the world before communism have been lost. thank you for all the information about the albanian american culture and history. i´m from germany and didn´t know much about the early albanian imigrants in america. very intresting. hope to visit america soon and learn much more about the albanians in america. thank you all for the information that you have done here.it's good and have the right thing,is you loking for something. Great job, thanks to everyone who contributed. Anyone knows how we can find data/records for our ancesters who lived in USA about 95-100 years ago? Is there any records about them? I have searched on immigrant ships, ellis island records and other public records but nothing so far. I am hoping that old albanian association from 1912 may have any records. Any tips is greatly appreciated. There will be Kippahs and Qeleshes for the service. I am trying to find more meaning behind the colors, dances, and the region where my father is from, Diber. Thank you for any help. This site is really wonderful. thanks a lot for this site.If someone can help me please can you send me some information about Albanian's diaspore in USA!!! from KOSOVA... that migrated to the United States in 1999. PROUD TO BE SHQIPTAR ! MA SHUMTI KOSOVAR ! This is a beautiful site. Thank you! I would love to find more information on immigration to the US. Time frame of the late 1950's to 1960's. Any help here would be greatly appreciated. Proud to be an American Albanian. So an interesting page about albanian people living in usa. In Chicago, there exists a community based organization of Catholic Albanians called Don Djon Buzuku Association which brings together its community to celelbrate it's culture, have mass togehter, share in traditions and community through Christmas Parties, Easter Parites and picnics annually. The DGBA has recently celebrated its 10th anniversary celebration. I am asking for my grandfather. He came in America in 1920. His name is Ilo Vasil Prifti. He was bourn in Korca, Albania. If you have any information inform me if is possible. I`m asking for my grandfather`s brother. His name was Xhemal Hysenllari and he moved to America between 1940-50. Where do I search for information? I'm American and since I have a BIG crush on a Albanian girl I have to say that this page really helped me knowing that there are a lot of things i did not now. Thank you for this homepage! My grandfather came here in 1907 from Katundi. However i don't know where he left from or where he arrived in the US How can I find thiss information? ?He does not show up at Ellis island with many name variations. His father preceded him here and a brother and sister also came. I read your site with much interest, and congratulate you on your incicive and comprehensive effort to introduce the Albanian culture and history to the wider American community. I am an Australian Albanian who can relate to much of the cultural information you have provided on this site, however I am somewhat intrigued by you reference to the early Albanian immigrants resistance or unwillingness to assimilate with the American culture or the American way of life. Albanians began arriving in Australia from about 1910 onwards and I must say our journey over the past one hundred years or so has been one of remarkable intergration, not assimilation. We consider ourselves as proud Australians with a rich Albanian heritage which we hope future generations will remember and keep alive. I am positive that the American/Albanians of the past and the present shared, and share, these same emotions and ambitions as we do. Intergation into the wider society is an objective and a character trait that seems to have been synonymous with the vast majority of Albanians in Australia, and it seems odd that it wouldn't have been the same in the very simmilar multicultural enviroment of the USA. My point, ( yes I am getting to it )is that we shouldn't confuse "assimilation" with "intergration". One word implies to adopt and invole yourself in the culture of the wider community without forgoing your native or hereditory culture. The other is to adopt a new culture and completely forget your own. It is obvious to me that this isn't the case with American Albanians of today and woudn't have been the case ( in my opinion) for the early Albanian immigrant into the USA all those years ago. Sorry for the lecture, just an observation. Once again, fantastic work. Cheers! Is there an Albanian cultural or social club in the Tampa Bay, Clearwater or west coast of florida area.? appreciated - Thanksour for your time. Under sources for addition study, please correct the name of the author of The Albanian-American Odyssey. I am the author and my name is Reverend Dennis L. Nagi, Ph. D. and not Page, Denna, L.
Thank you for your attention to this matter. It is critical that you make this correction. Can anyone recommend an Albanian interpreter in North Carolina? Any help will be greatly appreciated. It's very nice to read such nice comments about our country, Albania. I am from Ballsh, living in the UK for 13 years. My wife is English and she has been to Albania many times and just loves the place. We hope one day to be able to have a home both in the UK and in Albania so we can stay in each country as we wish. I will love, like I read before, Albania to be the biggest Illirian community as it once was and for everyone to see for themselves just what a wonderful country Albania is. Truly a paradise here on Earth. I am proud to be Albanian and of the race Arian. This is a beautiful site. Thank you! I would love to find more information on immigration to the US. Great article again, thank you! my husband has been friends for 13 years. im trying to learn the culture. Does anyone know if there is an Albanian cummunity in Los Angeles ca area? I just moved to Hollywood and trying to find some of my people's around here, thanks for your help. I`m asking for my grandfather. His name was Sadulla Ago and he moved to America between 1920-1932. Where do I search for information? Thanku you for this homepage. I think it's helpful for everybody. Thanks to the writer for fully highlighting so many aspects of the beautiful Albanian culture! With no intent on criticizing or entering a judgmental debate I might add that there is no way we can reveal how Greek/Turkish/Serbian culture has influenced the Albanian one. Being the small Balkans it is only natural for this social phenomena to happen in both ends but making such strong statements about how our cuisine, costumes, dances and songs were mainly influenced might make a lot of Albanians sensitive given the fact that we have so many unresolved issues in the region. I suggest the writer to dig deeper and read many sources of history and perhaps revise the text in a more objective manner. Best wishes and keep-up with the good work. I am researching the Albanian community of the Bronx. My focus is on their cultural and health-related concerns. This information is to be used for a culture based college health report. I would appreciate any input. Tahir "Tie" Domi played Hockey.. he is albanian.. He is an enforcer in the NHL. thank you for such an awesome writing and also very interesting facts that our fellows have done and actually many of them i dint know as an Albanian who lives here. The Albanian word Katund (the "town" the first American Albanian is from), translated in English is village. Granted, I left Albania when I was young, but I have not heard of a village in Albania called "the village". However, it seems more plausible that when asked, the person in question said he was from a village, given that some villages are so remote and small that even the majority of Albanians haven't heard of them.